ArcGIS Image Server delivers imagery to clients immediately and with consistency. Clients' IT involvement is reduced. Real-time error reporting is improved by performing quality assurance reviews online. As the volume of imagery increases, GIS organizations are pressured to find solutions to provide this data to their users as quickly as possible. Often the same source data is copied and processed several ways to produce different representations or "image products," including multiple band combinations, enhancements, and vegetative indexes. The customer has identified a feature that required a response. The Sanborn QA staff has closed the issue with a resolution response. A company that understands this well is Sanborn, an Esri Business Partner located in Colorado Springs, Colorado. Sanborn first became known back in 1866 through its finely detailed fire insurance maps, maps so well created that they are actually still used today. Now part of the DMG Information Group of companies, which is owned by the United Kingdom-based Daily Mail and General Trust, Sanborn continues to provide geospatial solutions to its clients. Government agencies and companies in environmental management, national mapping, and utility and energy markets rely on the company for their mapping needs. Sanborn was the first commercial mapping firm to develop and implement a system for producing digital orthophoto imagery without distortion. Sanborn's images include surrounding streets and other cultural features that are not ordinarily visible in standard orthophotos, using a method it developed called Method for the Elimination of Terrain and Relief Displacement in Orthophotography (METRO). This type of imagery is being employed by a significant number of GIS users as a suitable database layer for topographic, planimetric, or cadastral mapping; utility data capture; and accurate project analysis and design implementations. These images are created as second-generation imagery for clients requiring georeferencing to their original GIS data and as first-generation orthophotos of the highest accuracy. Many of Sanborn's imagery projects cover large areas with many customer stakeholders. Customers include large counties, such as the government of Maricopa County, Arizona; councils of government; and statewide initiatives. The delivery size of an imagery project ranges from 144 gigabytes for 1 area to 4.4 terabytes for up to 30 delivery areas, based on an average tile size of 2,000 x 3,000 pixels for a delivery area size of 2,000 tiles, the equivalent of 400 square miles. Sanborn's delivery format is RGB with a six-inch pixel size. Processing hundreds of terabytes of orthophotos per month for customers like these required Sanborn to find an innovative solution for clients who need massive amounts of imagery for their applications without extensive preprocessing or alteration of source data. Sanborn chose ArcGIS Image Server software from Esri, attracted by its ability to process imagery on the fly and on demand. The specialties of the two companies led Sanborn to become an implementation partner of Esri, providing innovative solutions for clients. Sanborn uses this server software to diminish the interval between when an image is collected and when it is available to users. Traditionally, image processing and distribution were considered two separate stages in image utilization. Imagery was first processed and mosaicked into a large dataset, then put on servers for dissemination. This separation has caused many problemslong preprocessing and loading times and data redundancy that exacerbates data storage issues and hinders efficient data management. With ArcGIS Image Server, these two stages are combined into one. 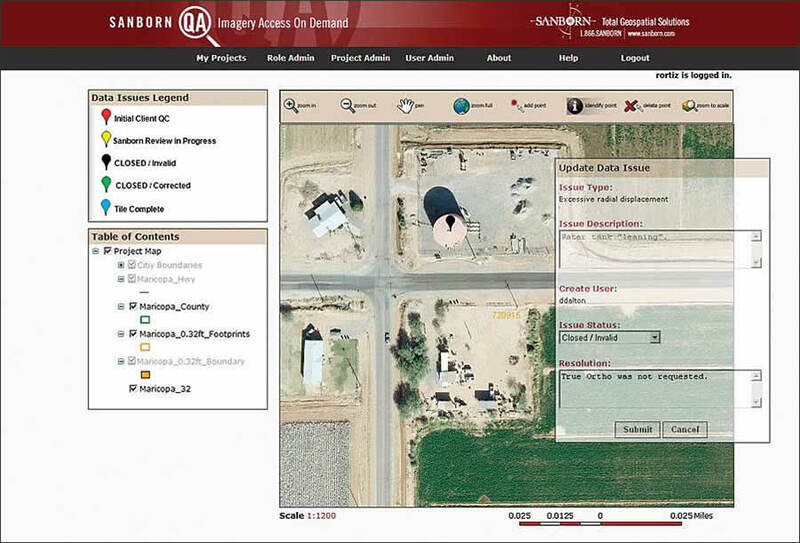 The data received from an imagery supplier can be directly served. This enables administrators to maintain only the primary imagery while creating multiple specialized products on the fly when required. This is a significant and unique paradigm shift in how imagery is managed, processed, and distributed. The customer has identified radiometry issues in the image. Sanborn is reviewing the issue for resolution. 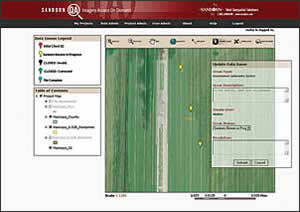 Using the software, Sanborn created Sanborn Quality Assurance (QA), a client imagery interface that facilitates Web-based quality checking of Sanborn-created orthophoto imagery products. Clients can view imagery through a standard Web browser as the imagery is being processed and add digital "issue points" to areas within the imagery that they feel may require attention. Clients being able to do this while Sanborn is processing the imagery makes data management simplified, reducing both the redundancy of the data and the delay in making the imagery accessible. 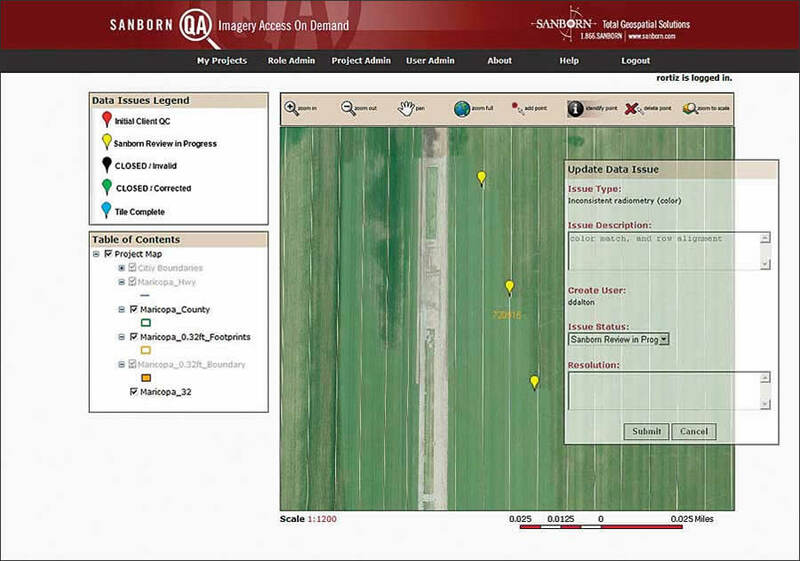 This real-time error reporting significantly improves the Sanborn-to-customer interface by performing quality assurance reviews online as soon as the data is processed rather than waiting for the orthophotos to be processed and delivered on CD or other storage devices. The online QA tool also reduces quality check error rates while ensuring customer requirements are met. This in turn shortens customer delivery schedules and gives clients the highest quality possible. Clients can review orthoimagery as soon as it's finished processing. Users are granted entry to the image Web application via secure login privileges to access a particular project. Clients may add to the project QA flags that require additional review, and these become immediately available inside the main GIS for viewing by Sanborn's production staff. Here, they are immediately available for technicians to review and resolve. These digital issue points give clients the ability to efficiently describe errors and, in turn, make fast, responsive changes to the imagery, such as color balancing and edgematching. There is also a reporting tool to give up-to-the-minute quality control status of the project. This makes the problem resolution process more streamlined. All imagery is served from a central image server to the client-side computer within a mapping interface in a standard Web browser format. ArcGIS Server 9.2 authors map documents that contain the image server data and QA/Quality Control (QC) feature classes. ArcGIS Server Web Application Developer Framework (ADF) functionality gives Sanborn the map navigation and feature editing it needs. Spatial data management technology included in ArcGIS Server provides access to the data, including stored QA/QC points. Using this solution, the QA/QC points are immediately ready for status and resolution, and updates to the points by the QA team are immediately available online. Blue pins illustrate the tiles that are complete through the QA process. "It's now easier for us as a company to assign our resources and offer flexible, efficient delivery options to our clients," says Melinda Brown, vice president of corporate marketing at Sanborn. ArcGIS Image Server is used for fast access to the extensive imagery using on-the-fly server-based image processing. Built on fully scalable enterprise client/server architecture, it offers multiplatform GIS/CAD/Web client access and direct access to many file formats and compressions. Using the software, multiple imagery projects can be created from a single source. Client visibility is granted into project management with macro-level access using a login access control with granular security role assignment. A custom ASP.NET application adds robust security. Users of the system log in online using a standard Web browser to access their project. Once logged in, the QA user is shown a list of projects that can be accessed. By clicking a link from a drop-down menu called Map, the user opens the QA environment for the project. The initial map that is displayed shows the project status through colored pixels, green specifying tiles available for review and red for areas not yet available. The user can then add and view the current issue points for the project. Points are symbolized by status and can be selected to view more details. Sanborn prototyped the system with customers from Colorado and Texas. Based on its positive prototype experience and customer feedback, the company is releasing a next-generation system for use by the government of Maricopa County, Arizona. 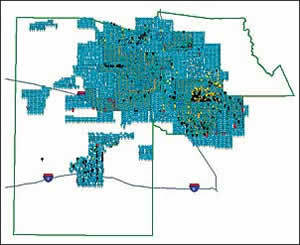 This county is approximately 9,200 square miles, with an expected data delivery size of around 4.4 terabytes. "The instant online imagery review accelerates our quality assurance and quality control review," says John Copple, chief executive officer of Sanborn. "We have given our customers the option to completely eliminate physical shipping requirements for QC purposes." Sanborn has also found it has successfully reduced its clients' IT involvement and provided for a secure solution for project management. Using this solution, Sanborn clients get fast image access optimized to their requirements with improved image quality and image metadata. By serving data to clients directly, Sanborn has realized a production-to-delivery-time decrease of approximately 66 percent in some cases. For more information, contact Melinda S. Brown, Sanborn (e-mail: msbrown@sanborn.com, tel. : 719-264-5611).